When you ask people what B2B sales is, many are able to crack the code that it’s business selling to other business. But that’s about it. Because there’s so much mystery around this field, we turned to one of the top B2B sales guys at Tesonet – Andrius. He shared a few insights about what this job really looks like and what it takes to do it well. Every company has different ways of approaching other businesses. It highly depends on the market and the ideal customer profile (ICP), but usually, the workflow is built based on a Sales Funnel. A step or two might be added or removed, but the idea is mostly the same: first, you create awareness, then build interest, and help clients make a decision that leads to taking action (e.g. buy, sign a contract, etc.). Though it seems quite straightforward at first, the reality is far from that. According to Andrius, each of the steps involves many different tasks that clients normally don’t get to see. There is a lot of work to be done – from defining the ICP to turning it into a signed contract. And all this has to be done while making sure that you’re targeting the right client. Otherwise, you’re just wasting time trying to convince the wrong one. So, skipping a few steps and jumping right into contacting everyone, might not be the best idea. Although automation has become a huge buzzword, it’s essential to understand that in some cases manual work can’t be avoided. For instance, tasks requiring critical thinking will never be replaced by tools, but there still are ways of how they can be integrated. “A lot of people like to think that you need a bunch of different tools and all work will be done for you. But too many tools can simply hurt your sales. The first thing we do is create a workflow for reaching other businesses. Only then we look for tools that will fit our workflow – not the other way around”, says Andrius. He also points out that in this case, you can’t really avoid trial and error. Through trying out different tools and how they interact with each other, you can find the best ones that will increase your productivity. For many, the idea of setting a structured workflow might seem a bit counterintuitive – people think that sales is a more creative field. But because in B2B closing a deal usually takes at least a year, discipline can’t be avoided. “What a lot of people don’t realize is that there are a lot of numbers and analytics involved. You’re analyzing your competitors, your ideal customers and most importantly, your funnel while setting clear goals. There’s not much room for creativity in this case. It’s all about discipline because without it you’ll be losing potential clients”, shares Andrius. Self-discipline and dedication are mentioned several times. Discipline helps to develop the “healthy habits” that are essential for a top-producer in sales. Continuous prospecting, follow-ups with “no reply” leads and tailor-made outreach – just a few core activities that lay a foundation for success in sales. After all, the job starts from “I’m not interested”. And getting an answer is the hardest and the most important part here. It requires a lot of persistence, but persistence is progress. 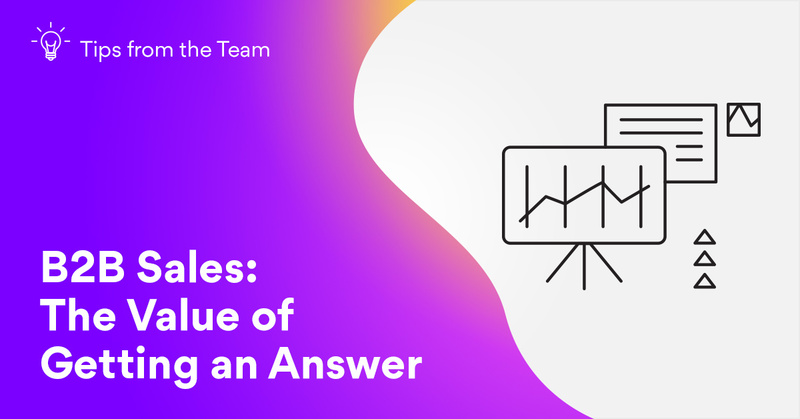 Even if the answer is negative, it’s still a chance to learn more about your customers or start negotiating. Recognizing the opportunities to learn and grow as a professional is important for those in B2B sales. The more you learn, the more you understand how clients think. And this is a skill that comes only with constant practice.